Client relationships are like marriages: There’s love, there’s friction, there’s pride and/or disappointment in your offspring/projects, and if it’s a good relationship you stick with it; if not, divorce is imminent. French Paper Co. has been a client of record for CSA Design for more than 30 years, which is longer than most marriages. This unique pairing has endured because CSA principal, Chuck Anderson and French Paper’s CEO, Jerry French respect, trust, and admire each other, and the work they do together has proven fruitious for both of them. Anderson tapped into the most important qualities of French Paper—its history and its six generations of family members that have run the business—and has built every aspect of the brand strategy around this, from promotions and products, to guerilla advertising and website design. Here, Anderson talks about his special relationship with the French family, as well as the remarkable evolution of the CSA Image archives, which now boasts more than 100,000 unique images collected and curated by Anderson over 45 years. You’ve had this incredible relationship with French Paper for 30 years. That’s unheard of. What’s the secret to sustaining this client relationship? I’m not sure there’s any secret. It might have something to do with the fact that we didn’t start by pitching our design services to French, but instead by loving and using their amazing paper. We were French’s customers long before we ever started working with them, which is always the best way to begin. It’s a lot easier and more fun to promote a product that you love and actually use, especially when the product is made by great people from one family that have been manufacturing it for nearly 150 years. We are also part of French Paper’s target audience of designers, which gives us a lot of insight. Focus groups are continual and consist of us and our many design colleagues and friends across the country, including daily or weekly discussions with Jerry and Brian French. French is a great American manufacturing survival story, and proof that design and innovation can help even small companies compete. 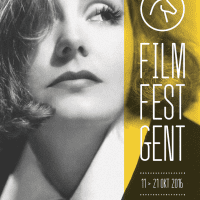 Recently someone asked me if we only use French Paper for our print design work, even work for other clients. I told them yes, and if we didn’t there would be something wrong because we also work with French to develop new paper lines. If we think of a paper that we or other designers might want to use, French will make it for us, so why would we ever use anything else? Not to mention a few words like friendship, loyalty, grateful, etc. I met Jerry French. Back in the mid 1980s. At the time most paper being used by designers was the slick, shiny, clay-coated variety. I preferred real, uncoated paper and was looking for some authentic newsprint and brown Kraft papers that could be offset printed. At the time these industrial grade papers were only available in giant half-ton rolls and couldn’t be printed. One day a paper distributor named Lamar Lundell, a local Minneapolis paper legend who has brought designers and paper mills together for the past 50 years, showed me some swatchbooks from French Paper. When I opened up the French Speckletone swatchbook I saw all of these incredible papers that I had been looking for. I started using Speckletone for my printed projects and I sent samples to French. Lamar walked into the studio one day, along with a man that he introduced as Jerry French. Jerry was holding all of the samples we had sent, and he said, “I love what you’re designing on our paper!” I replied “I love your paper!” I mentioned to Jerry that since we’ve already used French Paper for a lot of projects maybe it would make sense to produce a duo promotional book featuring our work printed on French Paper (I was working at the Duffy Design Group at the time). Jerry agreed, and French invested their entire (tiny) annual advertising budget to produce 5,000 small, wire-bound promotional books that were distributed to designers across the country. Six months later their No. 12, worst selling paper line, French Speckletone, rose to number one. Because of this, French immediately became a believer in the power of design. I recall Jerry calling to tell me that I now had a paper mill at my disposal. Back then I thought I would have a lot of clients like French Paper during my career. 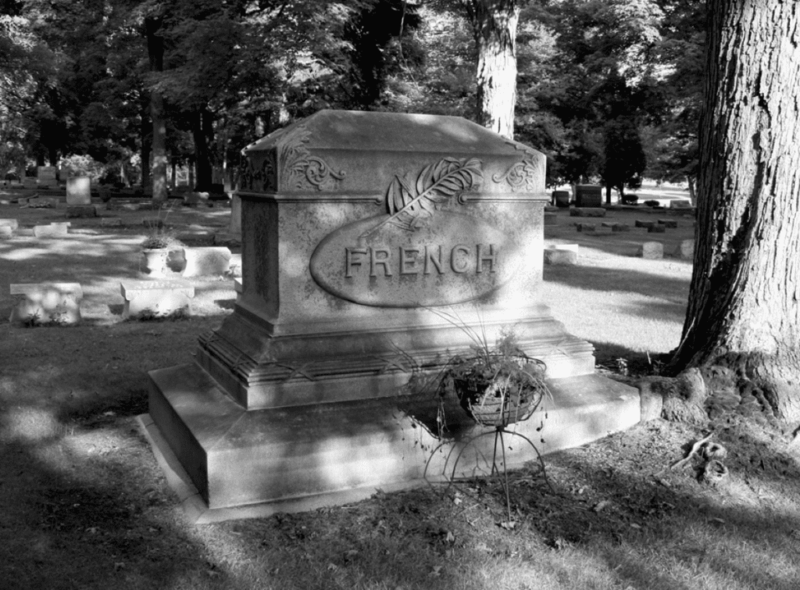 Now, 30 years later, I realize that I’ll never have another client like French. After working with Jerry for the past 30 years, I realize that nobody knows more about paper. This is why French has survived, while most other small mills have been shut down. Although our design has helped in terms of brand recognition, French has really stayed in business for one reason: Sheer force of will. For the past 40 years Jerry has worked 12 hours a day, six days a week, and half days on Sunday. I give Brian and Kim French a lot of credit for stepping up as the next generation of papermakers. French Paper has gained quite a bit of brand equity over nearly a century and a half. To put it in perspective, French was founded in 1871 before the light bulb was invented, and 15 years before Coca-Cola. French was also around before airplanes were invented, and 120 years before the Internet. French was the first mill to sell paper online, starting in 1998, the same year Google launched. French could have launched two years earlier but we had trouble convincing Jerry, who kept telling us he wasn’t sure how long this Internet thing was going to last. 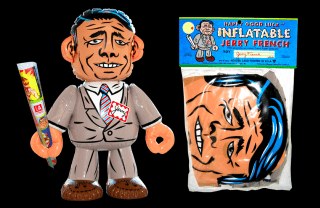 You created this larger than life character for Jerry French using humorous tactics, often at his expense. What’s the best (or worst) thing you’ve done with his likeness/name/logo that either really pissed him off or delighted him? And was it effective? Jerry is one of the most humble people I know. He hates when we use his likeness in the French Paper promotions (which of course we do all the time.) He’s a good sport with a great sense of humor, which is why we get away with it. He’s become the living, breathing, trademark character for French. We did this because most designers would rather buy paper from a small family owned mill, than a huge faceless conglomerate. 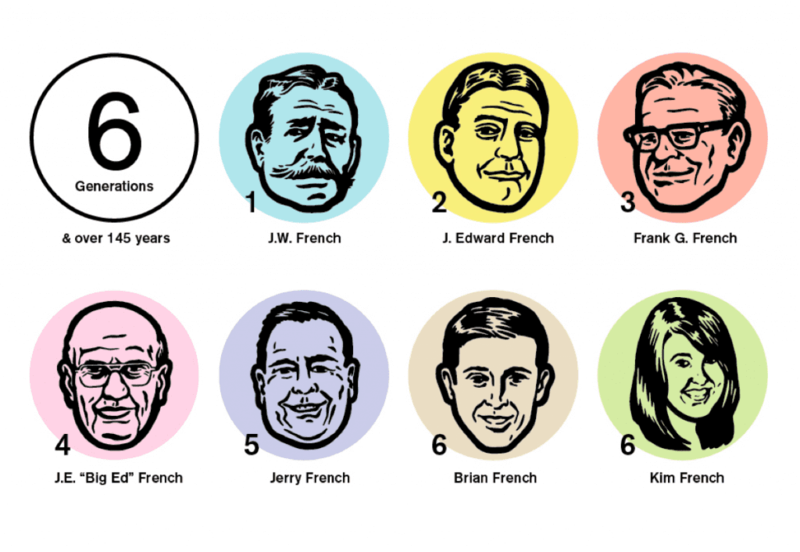 French Paper’s six generation family history makes them unique, so we thought we would use the French Family members as part of the promotions and brand. None of their competitors have a brand with family history and equity. There is no Mr. Neenah, or Mrs. Domtar, or Ms. International Paper, but there is a Mr. French. I’ve only seen Jerry really mad once because of a promotion we designed. 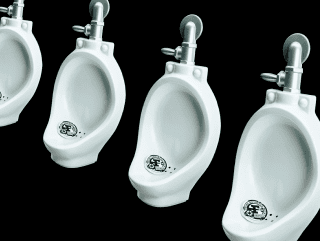 After the opening presentation at the HOW Design Conference many years ago, Jerry went to the bathroom to use one of the 30 urinals, along with hundreds of designers. Looking down, he noticed something printed on the urinal cake. It was his logo! As he turned to look down the long row of urinals, he discovered 29 other people also peeing on his logo. The yellow stained copy around the logo read, “Urine business with French Paper.” Jerry stormed out of the restroom and hunted me down. He said, “Anderson, this time you’ve gone too far.” (I guess we should have told him first.) I said, “Sorry, Jerry. We didn’t mean to piss you off. . . you should have seen our #2 idea.” After this Jerry was mad for a few more days until HOW voted the French logo urinal cakes as the most effective form of guerrilla advertising at the Conference. We’ve been around since 1871. For the first 115 years no one knew what we did. CSA put us on the design map. -Jerry French. 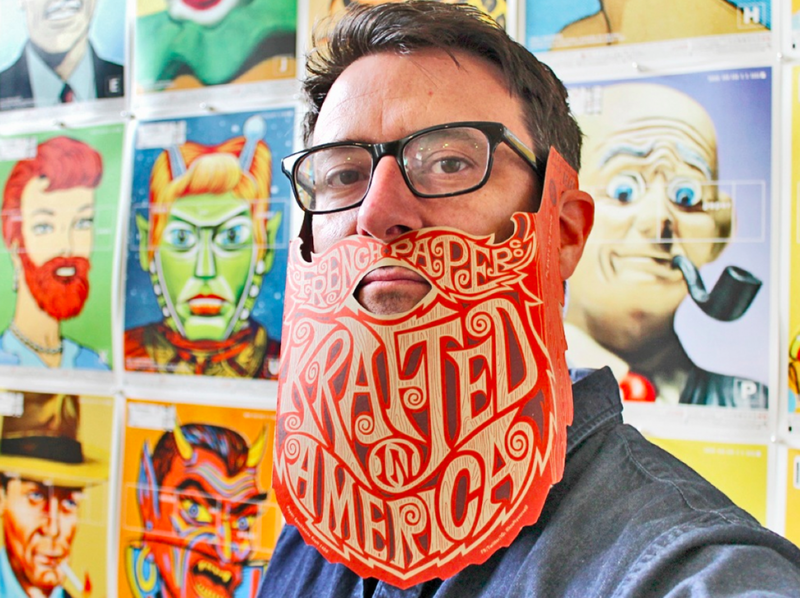 New French Krafted in America paper beard. This promotion includes a request to post selfies, and create a gallery of bearded designer portraits. These oddball promotions have defined French’s unique brand, while also helping them compete with giant paper conglomerates who would never approve anything this awesomely stupid! Do you have as good of a working relationship with Brian French? Yes! Brian is Jerry’s son and an incredible asset to French Paper. Brian has expanded French’s use of social media and brings tons of energy and new ideas to French. I’ve known Brian since he was a little boy, and he’s still as happy, funny, and positive as he was as a kid. Jerry’s daughter, Kim, recently joined the company after spending ten years in the New York fashion industry. Kim is based in Chicago, which is one of French’s most important strategic markets. Kim brings a new perspective to French. French family plot just a few miles from the mill. French didn’t acquire their 145 year history by buying an existing old brand, or making up a brand story. They built their history the hard way—with generations of family working at the mill their entire lives. I once asked Jerry if he would ever retire. He told me someday he’d leave French Paper the same way the three generations before him did. Feet first! 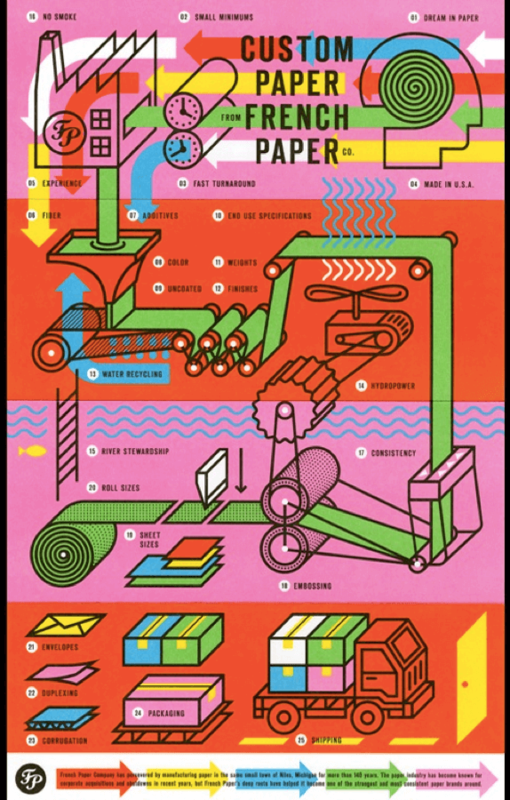 To the French family, making paper is more than just their business, it’s who they are. Sadly, last month Big Ed French passed away (4th generation). Ed was Jerry’s Dad and he lived to age 92, and still came to work practically every day—right up to the end..
Let’s shift gears and talk about how you’ve expanded your reach with CSA Images. 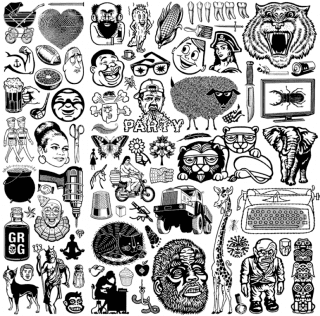 About five years ago, we decided to wind down the Pop Ink brand and products to concentrate on licensing CSA Images to manufacturers for use on products that can gain much broader distribution than we ever could with products we made and distributed ourselves. For example, we licensed our entire CSA Images collection to CustomInk to use exclusively on custom print, on-demand apparel. 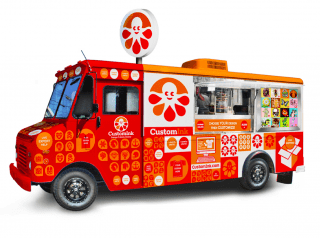 When we first met CustomInk six years ago, their logo was nondescript and the images and fonts offered on the web were terrible. Even more incredible was that despite all of these glaring issues, CustomInk had managed to build sales to $70 million per year! They grew about 40% each year, partly because of their amazing customer service and brilliant analytics. During the last recession, CustomInk’s growth slowed, and they started to address these brand issues. We designed their logo by transforming their internal sports team’s mascot “Inky the Octopus” into a friendly symbol. I like that the idea for the logo came from within the company. We didn’t just make something up. Since we started working with them five years ago, their annual sales have grown dramatically from $70 million to around $300 million. The power of design helped them achieve some of this growth. 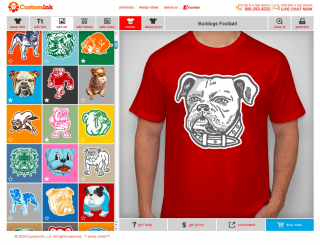 CustomInk brings good design to the masses by allowing average people to create their own professional looking T-shirts. 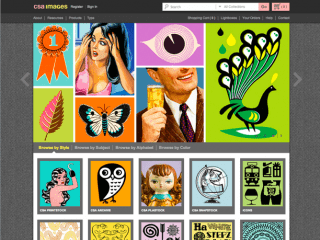 On your site, it says the CSA Images collection originated in the 1970s. Did this start as a personal collection of images that you saved over the years and then decided to sell in 1995? You’ve mentioned that you had a mentor as a kid and his work was the starting point for the collection. Explain that. The history of CSA Images actually dates back to 1974. While still in high school, I met a retired commercial artist named Clyde Lewis. We became friends, and a few years later Clyde passed away, leaving me his art equipment and illustrations spanning his career, from the 1930s-1970s. Clyde’s work was the starting point and inspiration for CSA Images. I started working on the first CSA book in 1988, and the second CSA Archive stock book of black-and-white illustrations in 1989. In total, it took about seven years to complete this book by hand with black-and-white ink prior to most design software and the internet. 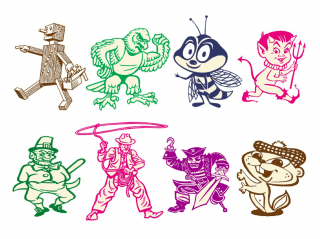 The CSA Archive volume one contained 7,777 illustrations, including some of Clyde’s. How do you determine what images will be successful/saleable, and which ones won’t? The CSA Images collection was created with a focus on aesthetics and thousands of diverse illustration styles that all work together, because they’re somewhat connected by an overall aesthetic. Some critics have called CSA Images a singular style, but we don’t think that’s an accurate description. Unlike typical stock image collections, we don’t attempt to create images that we think will sell, but instead try to create unique images that don’t exist elsewhere. We believe that if an image is aesthetically strong and unusual enough not to exist in other stock image collections, then it’s successful regardless of whether or not it sells. How many images are now in the archive? 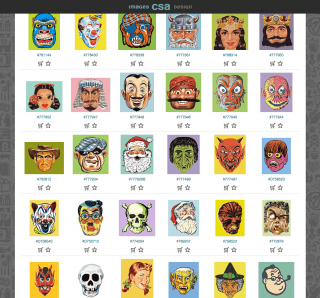 CSA Images is now the world’s largest collection of wholly owned illustration. Created by over 100 designers and illustrators, we’ve spent millions of hours building the library, which now contains roughly 100,000 images and design elements with an additional 100,000 images in process, originating from a base of millions, and constantly expanding. Unlike crowd-sourced stock image collections with images not owned by the compiling company, CSA Images is wholly owned so we can grant exclusive worldwide rights to the entire collection to manufacturers and retailers to use for specific categories of products. Nothing else like this exists. We also have a hand-lettering collection of over 10,000 words (rather than fonts) searchable by keyword, as well as more than 2,000 individual letters spanning the history of type from wood, metal, film to digital. CSA Images wasn’t created just by browsing the Internet and pinning images. I feel extremely blessed to have spent most of my life on this incredible design adventure, traveling the world and digging through obscure junk shops, antique stores, flea markets, and private libraries, to purchase the actual artifacts that make up the archival portion of the collection. The constantly expanding CSA Collection has been a base of inspiration throughout my life, and has allowed us to build on the shoulders of design giants who have gone before. Who’s your favorite “character” in the collection? Far too many to choose just one. 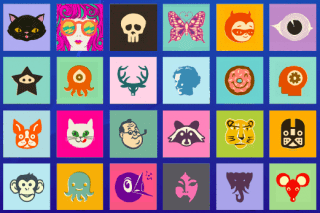 I really like thousands of the Kooky characters that live in the collection like these faces (see below), and also some of the more bizarre mascot characters like wood man and devil baby. 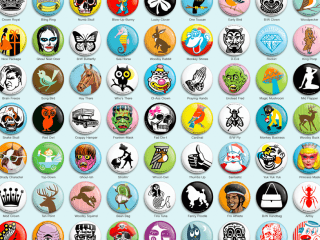 The collection also contains thousands of avatar icon characters that are diverse and modern. You were quoted as saying that a design cause that means the most to you is, “Archiving the obscure history of vernacular art design and type, and preserving the look of print in the digital realm.” What does this mean, exactly? It means not letting all of the incredible print design work created during the 20th Century by brilliant unknown and unsung commercial artists, designers, illustrators, and typographers go away by being hauled off to landfills, where unfortunately the majority of it is already. Over the years, in addition to creating original work, we’ve also purchased the rights to entire collections of art from creators, collectors, publishers, and copyright owners. We try to do our part by collecting and preserving actual artifacts from the history of design. This is important, because engaging with the past provides perspective and can help us more accurately envision the future. As Churchill once said “The further backward you can look, the further forward you are likely to see.” Our historic building and warehouse in Minneapolis contain millions of printed design artifacts and original art created and compiled over the past 40 years. One of my lifelong goals has been the preservation of images, design elements, and type spanning the history of modern graphic design, illustration, and print. In addition to preserving the best images from the history of visual communications, I’m also interested in refining a tightly curated selection of these images to make them more modern, simple, relevant, and useful for others to use in the digital realm.